This post somehow got lost and never posted. It was from Late April. Here goes. Pure awesomeness happened today... Ever since Miloh has been mobile he's been obsessed with my cameras. Could be that since the second he came out he's been in front of a lens. It's a toy to him, fun times. He used to grab my camera but then he became obsessed with my flash. 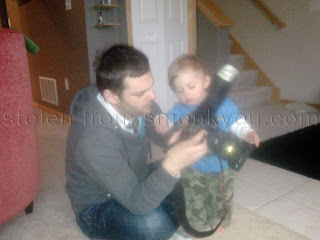 I'd never really let him play with it because it's pricey... And so he found the lens cap. I have a ton of photos with him eating the cap or trying to put it back on the camera. As he got more mobile I got scared for my camera. So he got my super old point and shoot. One we don't use anymore so it can be destroyed. But he's still a fan of my camera. And today he finally understood what was going on. At least today I finally noticed that he understood. We hung out looking through the viewfinder. He loved seeing mommy through it. Then I'd snap a pic and he'd be blown away when it was in the LCD second later. He's laugh, point and clap. It was amazing. And since photography is so close to my heart it meant a lot to me... I might have even teared up. Then I saw this pic that Staci took and I did tear up. Cute but I have no tears.